The US military has identified a man shown on a Taliban video as an American soldier captured in Afghanistan. He was named as Pte Bowe Bergdahl, 23, from Ketchum, Idaho. He went missing from his base in a Taliban stronghold near the Pakistani border last month. 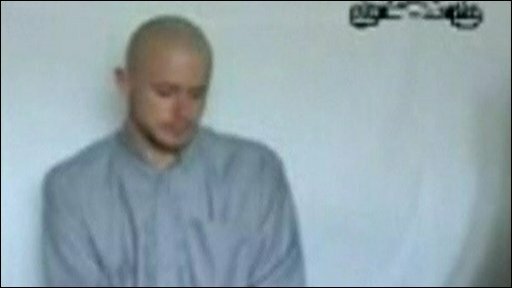 In the video, released on the internet, the shaven-headed soldier says being a prisoner is "unnerving". He also says US troops are suffering from low morale and should be brought home "where we belong". The Pentagon said Pte Bergdahl was serving with an Alaska-based infantry regiment when he walked off his base in Paktika province, eastern Afghanistan. Pte Bergdahl is believed to be the first soldier seized in either Iraq or Afghanistan for at least two years. In the 28-minute video, he says the date is 14 July and that he was captured as he lagged behind while on a patrol. It is not possible to verify the time and date the video was made. Pte Bergdahl, interviewed in English, says he has "a very, very good family" in America. "I miss them and I'm afraid that I might never see them again, and that I'll never be able to tell them that I love them again, and I'll never be able to hug them," he says. When asked about his condition he replies: "Well I'm scared, scared I won't be able to go home. It is very unnerving to be a prisoner." A voice off camera asks if he has a message for his "people". "To my fellow Americans who have loved ones over here, who know what it's like to miss them, you have the power to make our government bring them home," he says. "Please, please bring us home so that we can be back where we belong and not over here, wasting our time and our lives and our precious life that we could be using back in our own country. "Please bring us home. It is America and American people who have that power." Bob Bergdahl, the soldier's father, told the Associated Press news agency: "We hope and pray for our son's safe return to his comrades." US military spokesman in Kabul, Capt Jon Stock, condemned the use of the video. He told Reuters news agency: "The use of the soldier for propaganda purposes we view as against international law. "We are continuing to do whatever possible to recover the soldier safe and unharmed." Leaflets have been distributed and a reward offered for his safe return.